Totally awesome! I really like the idea of a wearable lunetta band, Stanley Lunetta must be proud. I can totally recommend the slacker melodygenerator as a good next project. But really the best thing to do is to get a breadboard and experiment. Build a few circuits, get familiar with the cmos ic's and the lunetta way of thinking and just go from there. Maybe this might work well as a hat? wow, finally made it trhough this thread! very helpful and inspirational. thanks! found an old joystick and working on building a quad 40106 osc in it. since these are normal off switches, though, i'll have to do the switching via 4066s and inverters, though, which I yet have to figure out fully how to. Just had someone on youtube ask for a more detailed schematic of the 4069 LFO since there is some confusion surrounding the parts involved. Please feel free to spread this around, just let me know if you made any cool stuff with it! I've only seen 4069 and 4049 being used in linear applications, I don't think other cmos ic's will work. My entire experience with cmos is based on trial and error, maybe some of the other forum members is willing to explain why it has to be the 4069UBE? you can use any non-buffered (and depending on the situation, buffered) non-schmitt trigger inverting logic for linear operation. that means 4001, 4011, 4009 etc. of course you can also use the 'building block' ic the 4007. 4001 and 4011 are pretty interchangeable when i was building analog drums i swapped between the 4011 and 4001 with no problem. basically buffered has extra inverters buffering somewhere in the circuit, where as unbuffered has just the gate. so for a 4011 buffered will have the NAND gate and some buffering on the input or output, depending on the manufacturer. an unbuffered 4011 will only have the NAND. that TI link is an interesting read, i would suggest it if you want to get serious about this stuff.. Cool, thank you for the reference. I'm not exactly a beginner any more, but with this famous 4069 circuit, I feel like one. I've tried to build it several times. Now I finally got some actual CD4069UBE's, but they don't seem to work any better than the particular model I had before. I built the circuit exactly as in the one posted above by tjookum. The triangle is not smooth, there are glitches where the wave falls or rises vertically, which is audible as a click at lower frequencies. In the scope shot below, the bottom horizontal trace is just to show where the actual ground is (notice the approx. +3.5 V DC offset!). 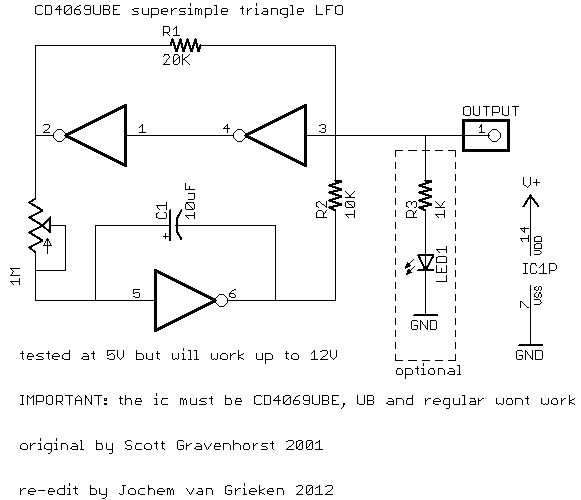 Ultimately, I'm looking for a cheap (low-parts count) triangular very LFO I can feed some "vactrols" (opto-isolators) with. Scope shot for CD4069UBE triangle wave circuit. Tjookums schematic is meant for 5 volt operation.you will need to tweak values for different supplies. I have schematic for 12v and 9v somewhere if you'd like. Oh yes, 9V please. I forgot to mention that's what I was using. The schematic did say it will work up to 12V. well, it does 'work' but not the way it should. heres the 9v one, or 12v. R8 may need to be adjusted a bit. but its pretty good as is. the output will never quite be rail to rail, it'll always float above ground and below +v. you would have to remove the offset and run it into an amp to get it to be full swing. if you want this to be an LFO C1 should be larger. Thank you psyingo for providing a lot of additional info. I did notice in my limited experiments that the R8 and R9 resistance ratio is crucial when working with different voltages. That's why I altered the original by scott gravenhorst to my preferred 5v. And thanks RingMad, I think that scope image shows very clearly the problem some are having with this circuit. I've used it on several drone type circuits and I've discovered it's very hard to make a pure triangle wave with linear cmos. But as everything wich involves the lunetta way of thinking, I considder it a feature . I hope psyingo's schematic works for you(and others who need it at 9v). Thanks a lot, Psyingo! I finally get a nice triangle out of the 4069 on 9V! This also works quite well as a VLFO (Very Low Frequency Oscillator). With an approx. 4700uF cap in there, I get around 17 minutes per cycle (approx. 0.001 Hz), which is what I was aiming for! And it's quite smooth. With a bit of DC shifting, this should work quite well for my application. Posted: Fri Jul 20, 2018 6:41 pm Post subject: Fiddling with the 4040 + 555 to make some crazy noise. Subject description: Making weird noise. After building my goto 555 timer toy organ from the Forrest Mims mini engineer's book and looking at stomczak's pinout for the 4040. I mixed the two to make some unusual noise. After a bit of poking around, I managed to make some interesting sounds. You'll find plenty of extra audible bling here! 4069UB and UBE work better because of the internal construction of the chip. The buffered version has 3 inverters in series per gate where the UB gates are just one inverter structure. Each inverter is a pair of CMOS transistors. Look at the datasheets for both B and UB versions and you'll see this. In the case of the buffered ones, the gain of the circuit when the input is at (Vdd-Vss)/2 is extremely high which improves noise immunity and increases the switching speed. The extra gain makes using it as a linear amplifier more touchy. As for why the triangle doesn't have perfectly straight ramps like an opamp would have, it is mainly because even the unbuffered (UB) chips exhibit highest gain when the input is (Vdd-Vss)/2. It isn't nearly as bad as the buffered ones though. 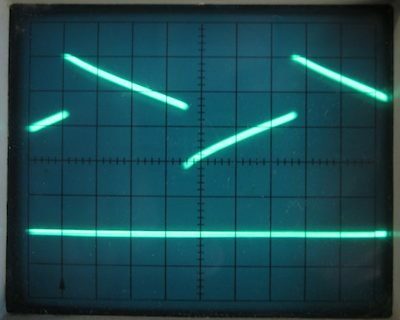 When I first did this circuit for my Fatman, I saw this effect on my oscope, but I didn't care and liked the fact that it's slightly curved instead of dead straight. The ramp is actually a spline shape. This can actually be abused a bit more to make a waveform something like a sine, though also not perfect. Using some simple linear amplifiers to "waveshape" the LFO would exaggerate the spline curve effect to the degree that the point can be made to almost disappear into a curved top/bottom like a sine.